Every year, we all wait for one festival and that is Diwali, the festival which brings in lot fun and joy. A festival, which is incomplete, if not celebrated with our loved ones. So, our favorite TV actress, Sanaya Irani too couldn't celebrate Diwali without her hubby Mohit Sehgal. Mohit, who is currently shooting for his upcoming movie Badnaam in London. The actress flew down to London to see husband, days before Diwali. 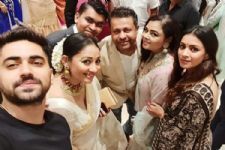 Taking to his friends on Instagram, Mohit shared a picture of them along with his team and captioned it, "Diwali celebrations begin." 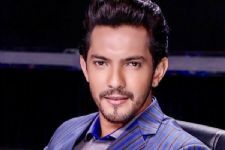 Badnaam is Mohit's upcoming bollywood movie, co-starring actress Priyal Gor, Aniruddh Dave and Barkha Bisht Sengupta in important roles. The movie will also mark the directorial debut of Vikram Bhatt's daughter Krishna Bhatt. 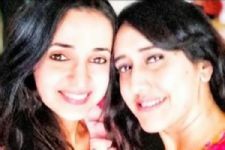 Both Sanaya and Mohit shot to fame with Miley Jab Hum Tum and since then, the couple is together. Celebrating Diwali with our is what everyone loves, isn't it heart-warming? You are so pretty loving u more n more as always! Sanaya Irani...how adorable you look with tika and sindoor! Keep rocking dear and all the best for your upcoming film Ghost. Sanaya, waiting for your next project. Ghost shooting starts 16th November. Actors Barkha Bisht and Aamna Sharif to come together on TV, find out more! B-town Celebs wish their INSPIRATION A.R. Rahman, Happy 52nd Birthday!